Even after 15 days of Protests by Egyptian people the Emotions are not coming down and people are still coming on roads specially in Egyptian Capital Cairo demanding Hosni Mubarak to go. 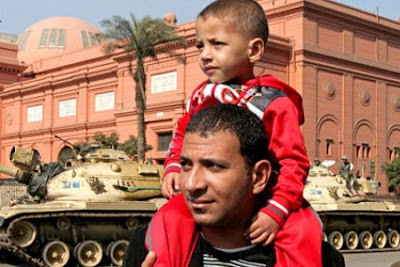 On Wednesday 9th February as well Millions of people gathered at Tahrir Square of Cairo. Now Protesters has decided to do big protest in front of Egyptian Parliament. 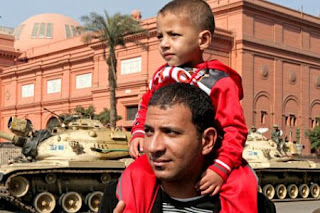 Watching this situation Egyptian Army has increased Tanks Deployment in different areas of Cairo. Muslim Brotherhood and other Political parties has also decided to do a big march towards Presidential Palace tomorrow on Friday. The Casualties in results of Protests and Clashes continues to grow up. According to different reports total death till now in 15 days are more than 300 while Injured are over 5000.